I've decided to do the first ever series on my blog and it's focusing on colour! Hooray! The idea of these posts is that I will select a few products from my stash that fit a certain colour, starting with bronze eyeshadows. I am an absolute sucker for a bronze eye and think they look great on all skin tones. I wasn't sure whether to mention this product or not as I don't actually get on with the formula- it creases to no end on me- but there is no denying its one beautiful bronze. 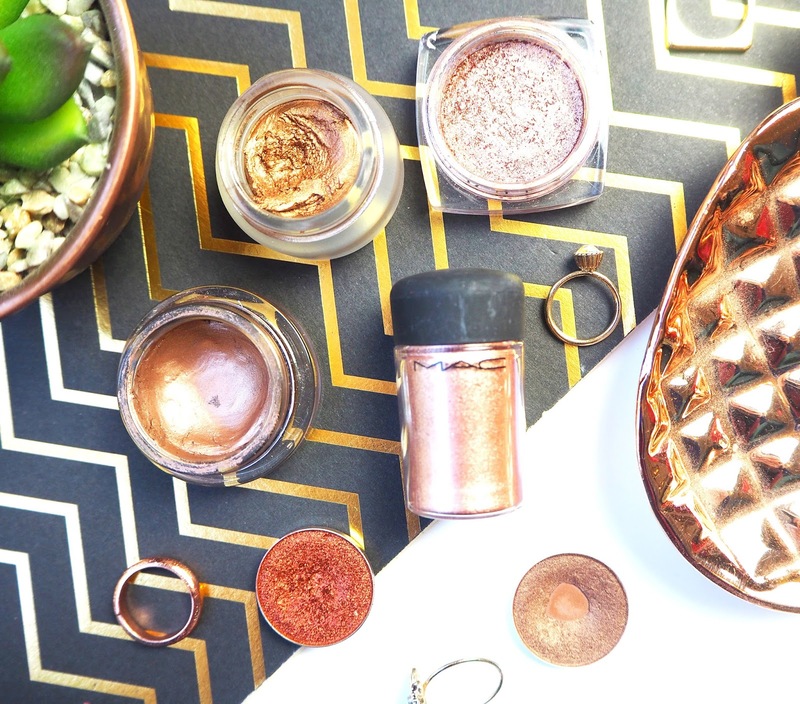 Charlotte Tilbury Eyes To Mesmerise in Bette (£22) is actually described as an 'Amber-Gold' but I feel it still sits in the bronze bracket. It has a gorgeous gold undertone that would suit so many people and warm up your complexion. This is a throwback for me and a product thats been well loved, Mac Wookwinked (£10- pro pan) is easily one of my favourite eyeshadows from Mac so it had to have a mention. Such an easy shade to wear, I love applying this all over the lid with a flat shader before buffing it out with a clean fluffy brush, it takes two seconds but looks super glam. Loreal Infallible 24 Hour Eye Shadow in Amber Rush (£6.99) is a pretty pressed pigment. Its a warm, sparkly shade and whilst you can build this up to look really intense I personally like using it more as a wash over my eyelids. It's gives a nice amount of colour to create a day to day look. Another pigment and another product from Mac. This time a lose pigment though, Mac Tan Pigment (£16) is a stunner. Admittedly this isn't my most reached for as it can be messy to work with but on a special occasion when I have a bit more time to do my make up I love this one. To step it up another notch I wet my brush, usually with Mac Fix Plus, and it makes the pigment appear almost foiled. I have spoke about the Maybelline Colour Tattoo in On And On Bronze (£5.99) about a million times it feels! But for anyone that hasn't heard me raving about this before here goes... basically its a cream eyeshadow that can be used as a base for powder shadows or on its own. I always use it alone because I love the classic bronze shade and the amazingly long wearing formula. This is easily my favourite cream eyeshadow of all time and its such a total bargain too! Last but in no way least is Make Up Geek Foiled Eyeshadow in Flame Thrower (£7.95), I'm not sure its technically a bronze but I thought it was close enough. It's incredibly warm toned with an almost orange undertone to it. The formula of this never ceases to amaze me, its so smooth feeling you could be mistaken for thinking its a cream product. The pigment is also out of this world, the swatch is one swipe! Which bronze eyeshadows do you love?